Strange Culture: Does Being in One of the Top Films Help You Win A Best Actress Oscar? Does Being in One of the Top Films Help You Win A Best Actress Oscar? 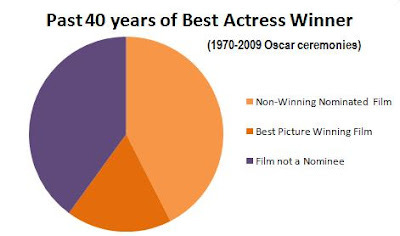 In my data collection, I determined that over the past 40 years, 60% of the Actresses who won best picture were actresses in films that were also nominated for best picture (this is represented by the to shades of gold on the pie chart above). So, for 24 of the 40 Oscar winning actresses there film was a contender for the top prize, while 16 won the award absent of their film even having a nomination. (The 40% represented by the purple section of the pie). Then 7 of the past 40 winners in the actress category have won along with their film (represented by the darker gold). What do I make of this? It would seem to be that is easier to win the Oscar in this category in the Best Actress category if the film is considered one of the year's top films by the Academy. Although, at 40% an actress without an accompanying film nomination shouldn't feel overly disadvantaged. A lot of The Blind Side's success is down to Bullock's momentum. The fact that it's nominated really does underline how much people buy into the performance. It's usually a combination of factors that determine who wins but this seems a bit like 2004, when Hilary Swank benefitted from the Million Dollar Baby love. @ Cal - I agree. I wasn't sure if Sandra had a real chance, but then when I saw the words "The Blind Side" pop up on the Screen Oscar Nomination morning, I knew her chances increased tremendously. If I had seen Julie & Julia pop up as a top 10 contender, I would have revised my opinion the other way.